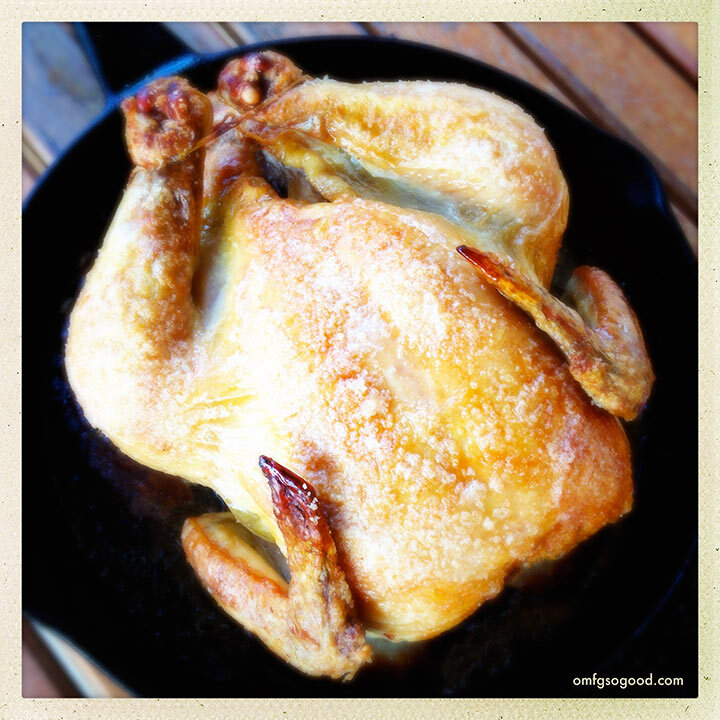 simply perfect roasted chicken | omfg. so good. If this isn’t the juiciest roasted chicken you ever make, I’ll eat my hat. Do people even say that anymore? If not, I’m bringing it back as of right… now. I’ve got a few tricks up my sleeve that, until now, have remained ‘in the vault.’ I guess since you’re reading this you’ve earned my trust. But if you tell anyone else, you’ll have to eat your hat. The first trick is to roast the bird in a cast iron skillet on super high heat. Skip the roasting pan, skip the roasting rack, skip the low and slow. The second trick is to heavily salt the outside of the chicken, but that’s all. Resist the urge to pour melted butter on it. Resist the urge to pour juices of any kind over the top. The chicken doesn’t need a bath. It needs a salty, crispy, golden brown skin. The third trick, and this one is a gem, is to roast the chicken on a bed of sliced bread topped with your aromatics. I know, sounds strange. Trust me, it’s not. Think about it… instead of the bottom of your bird sticking to a hot pan while all of the juices run out, pool and burn beneath it, the precious juice absorbs into the hot bread then recirculates through the lemon slices, thyme sprigs and garlic cloves… right back into the delicious meat. The result? Perfectly seasoned, crispy skinned, yet juicy as all hell, roasted chicken. In just over an hour. Sha. Boo. Yah. Slice the lemon and peel and smash the garlic cloves. 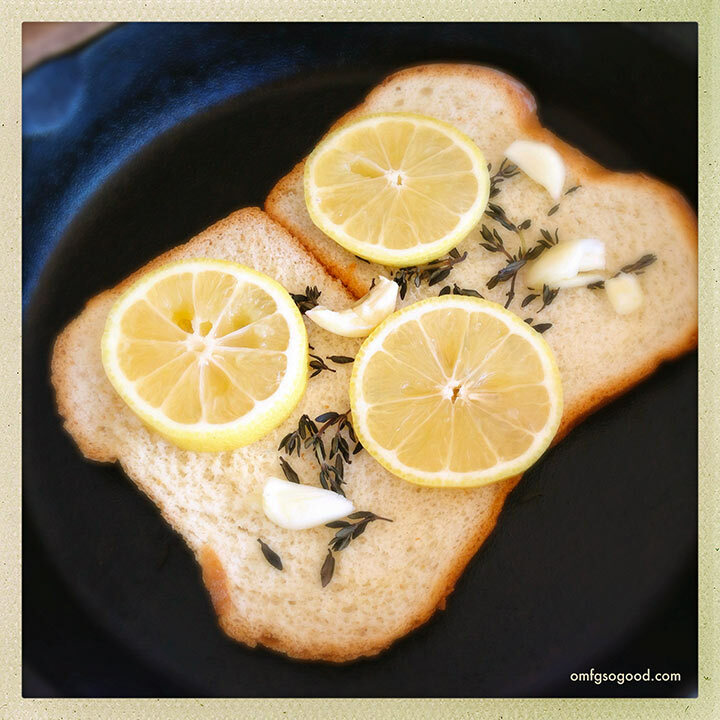 Arrange your bread slices in the bottom of a large cast iron skillet or oven safe saute pan, drizzle with a bit of olive oil, then top with three lemon slices, half of the smashed garlic and the thyme sprigs. 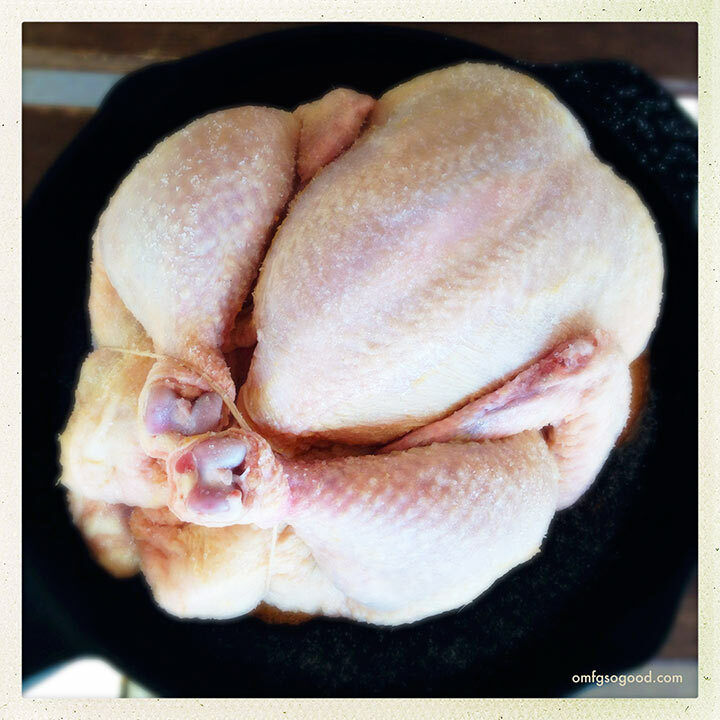 To prepare the chicken for roasting, clean the outside and pat dry with a paper towel. Stuff the remaining lemon slices and smashed garlic into the cavity and toss in some salt. Use kitchen string to truss the legs and wings, then arrange it on top of the sliced bread bed. Generously season the outside of the chicken with kosher salt. I’m talking, make it rain salt. Like a full tablespoon of it sprinkled evenly over the entire outside. Roast the chicken in the preheated oven for 55 – 60 minutes, or until the juices run clear and the legs easily pull away from the breast. Let the chicken rest for 15 minutes or so before carving. Before serving, drizzle with melted butter. Yeah. Now’s the time to give the bird a butter bath. This makes a perfect Sunday meal for the family, served alongside a spoonful of classic creamy mashed potatoes and steamed sweet corn. That sounds surprising simple. I never roasted a chicken before but you made it look easy! I take it the bread at the end is just garbage? Ah yes, toss the bread at the end. Forgot to mention that! Seriously, one of my all time favorite comfort food meals. If they made that smell into a perfume, I’d wear it every day. Pingback: Roasted Chicken with Lemon and Basil | Red Beans and Eric… err Rice!